Retrofits & Repairs – EA Design, Inc.
We understand that much of the equipment you use is custom-designed specifically for your product or process. You are used to its’ operation and support-needs. The thought of ever having to replace it can cause grave concern. While you can handle the physical aspects of its maintenance and keep it running, the schematics are now either missing or so far out-of-date as to be useless. The wiring is getting stiff and breaking more and more often. Electronic components are getting harder to find and the OEM is either out of business or does not care to support such outdated equipment anymore. Obtaining a replacement system is often very time-consuming and expensive. You have explored the option of having your maintenance department perform the needed upgrade but came to realize your in-house people are not qualified to make the needed changes. Enter Expert Automation Design. We have been involved with technology since microprocessors were a distant gleam in their inventor’s eyes. We understand much of the older technologies as well as the newest. We specialize in evaluating your system’s needs and then replacing all outdated components with the latest technology. 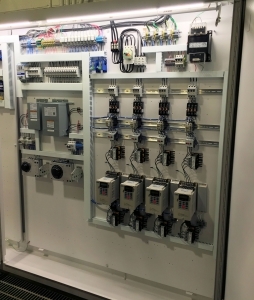 We can translate your existing controller programming so that the system continues to operate as originally designed. We then add enhancements such as touch screens, and data- communications. 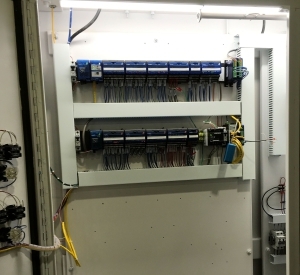 We prepare off-site as much as possible then schedule a few days to take your system down and perform the upgrade. We then call upon your maintenance people and operators to test the system and make any last-minute changes. We then clean up and stand aside to watch as your system begins a new life. You will now have a machine that you are comfortable and familiar with. All of the stockpiled spare parts you have still apply and the operators can settle right back into their familiar routines. Our workmanship is warranted for one year. Components are warranted by the manufacturers. Software and screens we create have a lifetime warrantee: we will return at no cost to you to fix any errors or oversights in the software or screens at any point in the future. If the system is connected to the Internet, we can perform most or all such changes and repairs remotely!